Rogers Place will feature four public artworks. Each piece invites the user to interact with it – whether that is standing in the shade under Essential Tree, posing for team photos on the steps in front of Skater’s Arch, seeing how Figures in Motion changes as you walk closer to it, or meeting with friends at the Iron Foot Giant before an event. This artwork is being created through the City of Edmonton's Percent for Art policy, which dedicates 1% of qualifying construction costs to acquiring public art in City infrastructure. The Edmonton Arts Council manages the selection process, acquisition and conservation of Edmonton's public art. The largest piece will be a spectacular 14-meter diameter circular mosaic set in the floor of the Winter Garden for Rogers Place. 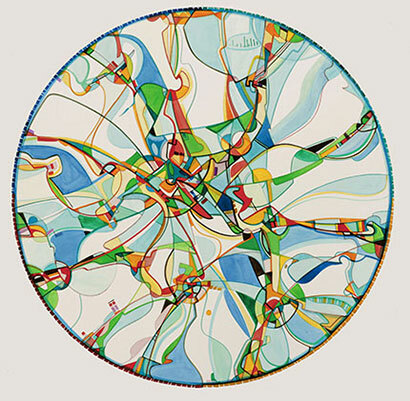 World-renowned Aboriginal artist, Alex Janvier, created this artwork. Mr. Janvier has deep roots in Edmonton, and his work not only ties the Winter Garden to the local art community, but also makes Rogers Place a unique reflection of our history and culture. This piece honours the land area where Edmonton is located, highlighting the colours of beautiful sky, the stories of the area, and clear waters from far away mountains. It illustrates Edmonton's history and continuing legacy as a meeting place: "All roads lead to the area, Edmonton, as it is a central destiny for all who came before, and who came after." 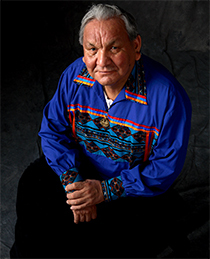 Alex Janvier was born in 1935 and is of Dene sųłı̨né and Saulteaux descent. He is a Residential School Survivor (Blue Quills Indian Residential School near St. Paul, Alberta). Mr. Janvier is one of Canada's most significant, pioneering Aboriginal artists. As a founding member of the Professional Native Indian Artists Incorporated (PNIAI) – the so-called "Indian Group of Seven" he was key in challenging perceptions of Aboriginal art. Essential Tree, designed by the Berlin based artist collective realities:united, is a large representation of the abstract trees used by architects in their design models. The artwork explores the natural environment, while at the same time paying homage to the topiaries of the European Baroque era. 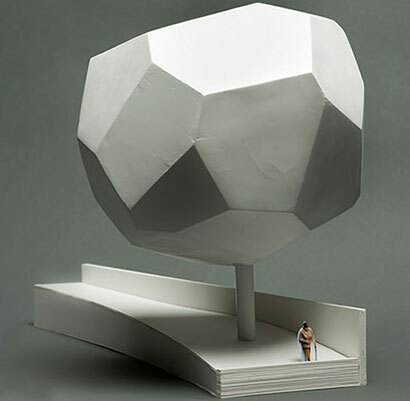 Placed in a planter on the north west plaza outside of Rogers Place, the sculpture interacts with the real Ash trees, which will be planted in the area. It will take 60 years for one of these trees to reach the scale of this 14.5 metre tall, faceted sculpture. realities:united is the brainchild of brothers Jan and Tim Edle. The Berlin-based “studio for art and architecture” has gained international recognition for the initialization and realization of art and hybrid art installations at an architectural and urban scale. Pieces by the brothers can be found both in private and museum collections, including the Museum of Modern Art (MoMA) in New York as well as several public art collections all across the globe. Their “Phantásien” installation for the Mill Woods Branch of Edmonton Public Library has just been completed. This brightly coloured, circular sculpture achieves a dramatic pictorial presence. Its flowing, window-like form becomes a framing device capturing the dynamics of ice-skating. The push of the blade, as it cuts into the ice surface to propel the skater forward, is exemplified through a myriad of cut-out shapes, which evoke the style of Henri Matisse, creating the sculpture’s dynamic form. A stepped, podium-like plinth combined with the sculpture’s frame-like form create a welcoming symbol just outside of the Downtown Community Arena in the north east plaza – an artwork functioning as a place-maker identifying the facility and the activities therein. The setting encourages citizens and visitors to embrace it as a meeting place and to use it as a dramatic backdrop for photo opportunities. Douglas Bentham, RCA, lives and works in a rural setting near Saskatoon, Saskatchewan. The recipient of numerous awards, Bentham graduated with a BA Advanced degree in painting from the University of Saskatchewan in 1969 and a MFA in sculpture in 1989. His sculptures can be seen in many settings across Canada. Bold, enticing, and free flowing, the work centres on a skater, and changes when viewed from many distances and angles by both pedway and rink users. 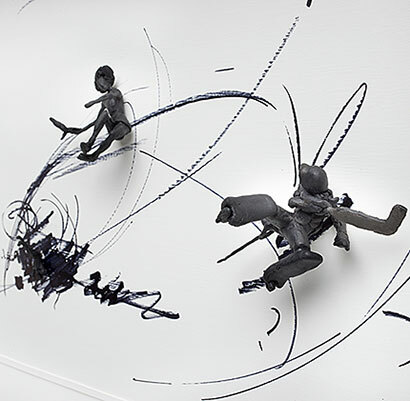 The closer you get to the artwork, located inside the entrance of the Downtown Community Arena, details such as pucks, skates, gestures, and small figures reveal themselves. Al Henderson was born and raised in Alberta and studied at the Alberta College of Art & Design. He has created a number of public commissions within Alberta and has consulted on public art at the provincial level. The recipient of project grants from the Alberta Foundation for the Arts (AFA), Henderson’s works are included in the AFA Collection.